If Norma Bridwell was apprehensive about showing her artwork to a Vineyard audience for the first time, her fears were unfounded. 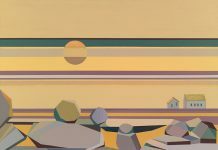 Now hanging at the Anchors in Edgartown is a selection of paintings by Bridwell that date from the 1960s to the present day. 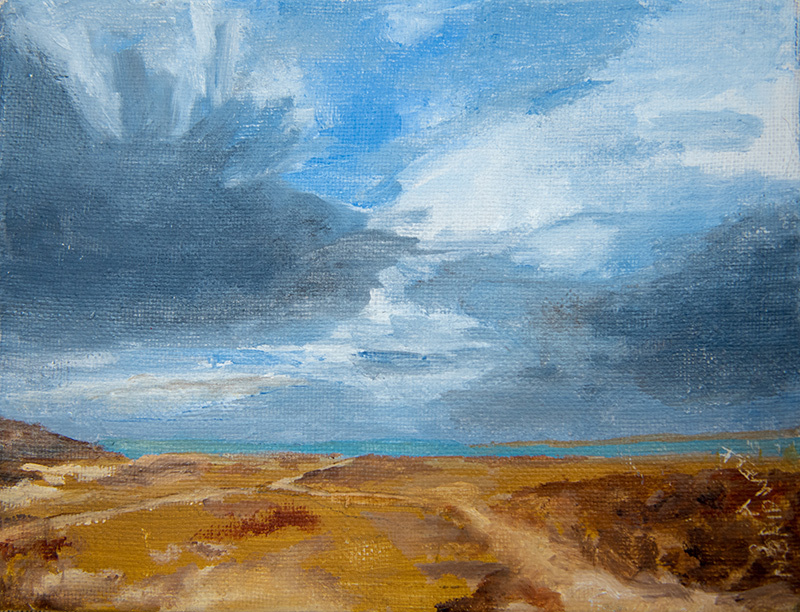 All are beautifully rendered landscapes capturing the unique beauty of the Island. 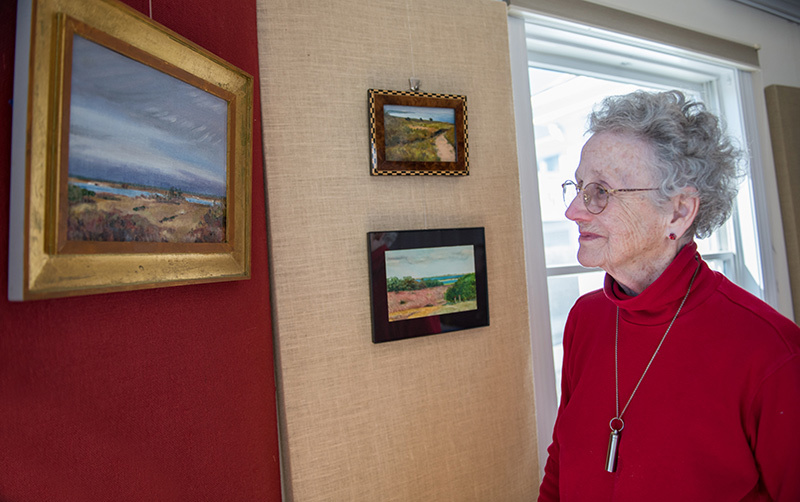 The 87-year-old artist has been painting since her early twenties. However, her career took backstage somewhat to her husband, the late Norman Bridwell, when the couple had children and the latter’s Clifford the Big Red Dog series took off to children’s book legend status. Although she relegated it to a hobby, Ms. Bridwell never stopped making art. The current exhibit showcases the work of an artist with both serious talent and vision. Mr. Bridwell visited various publishers with his portfolio, but couldn’t get anyone interested in his children’s illustrations until one young editor suggested he try writing a book. Ms. Bridwell suggested he start with one particular illustration of a hound dog with a toddler who reached to about the level of the dog’s chin. The dog was red for no particular reason other than to add a splash of color. “Over the weekend he wrote ‘Clifford the Big Red Dog,’” recalls Ms. Bridwell. “Neither of us took this dummy seriously. He dropped it off at the publishers.” The rest is children’s book publishing history. The “Big Red Dog” series ran to an astounding 80 books, spawned a television series and a movie, and helped establish Scholastic books as a premier publishing company. After many years in New York, eventually the couple decided it was time to relocate. “We got to the point where the kids were in school in New York City,” says Ms. Bridwell. “We loved it, but it wasn’t the place to raise children.” In 1967 the Bridwells moved to the Vineyard and settled into a home in Edgartown. Both became very involved with the community. 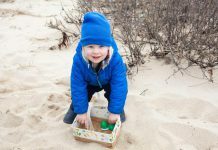 Ms. Bridwell did volunteer work with the Martha’s Vineyard Hospital and Community Services, and both were active supporters of the Boys and Girls Club. Although she tends to downplay her various achievements, Ms. Bridwell lived a very full and exciting life before she met and married her husband of over 50 years. “Instead of accepting a full scholarship to Indiana University to study physics, I joined the Army,” says the artist. “I realized that I had to grow up. I was kind of scared to go out in the world.” Ms. Bridwell was stationed at Fort Leavenworth in Kansas, where she served as an x-ray technician. “I remember x-raying Chiang Kai-shek’s son,” she says, adding, with characteristic spot-on humor, that he was understandably under some stress at the time. Taking advantage of the GI Bill, Ms. Bridwell moved to New York to study art. She says that she wanted to attend the Art Students League, but that wasn’t an option at the time. “The government thought it was too pink,” she says, referring to a term adopted during the McCarthy era for a person or organization with possible Communist leanings. Instead she opted for the patriotically named American School of Art, and then pursued a successful career as a commercial illustrator. 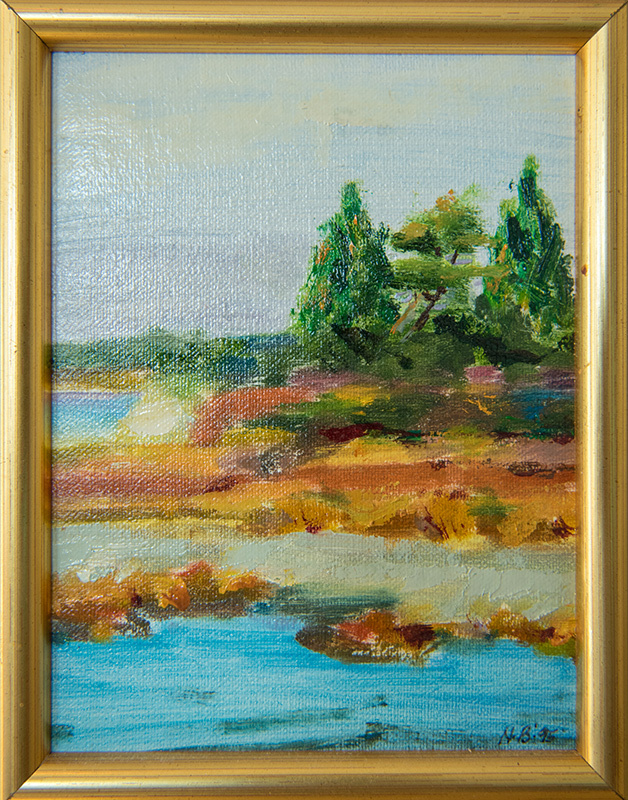 After moving to the Vineyard, Ms. Bridwell took up oil painting, favoring nature scenes — sunsets in particular. “Norman and I used to drive out to the Bend in the Road Bridge about twice a week to watch the sunset,” she says. Although she has experimented with watercolors, Ms. Bridwell prefers working with oils. Borrowing a technique from the full year that she worked exclusively in watercolors, Ms. Bridwell often starts with a wash created from thinner, diluted paint, and works on heavy watercolor paper. Ms. Bridwell continues her studies, traveling to Boston once a week in the off-season to take a class at the School at the Museum of Fine Arts. “I’ve been going for 26 years, and had the same teacher all that time,” she says, adding that many of the other students have come back about as long. The weekly trips to the city allow Ms. Bridwell to indulge her fondness for urban living and to continue her painting. “The class I’m in is for people in all different stages of development,” she says. “We really help each other with critiques. The teacher takes a very different approach. He doesn’t teach us how to paint so much as he teaches us how to see. He will use different tricks to teach us how to see from a new perspective. Ms. Bridwell has never been very interested in selling her work. “If someone wants to buy something of mine, I ask them to write a check out to the hospital,” she says. 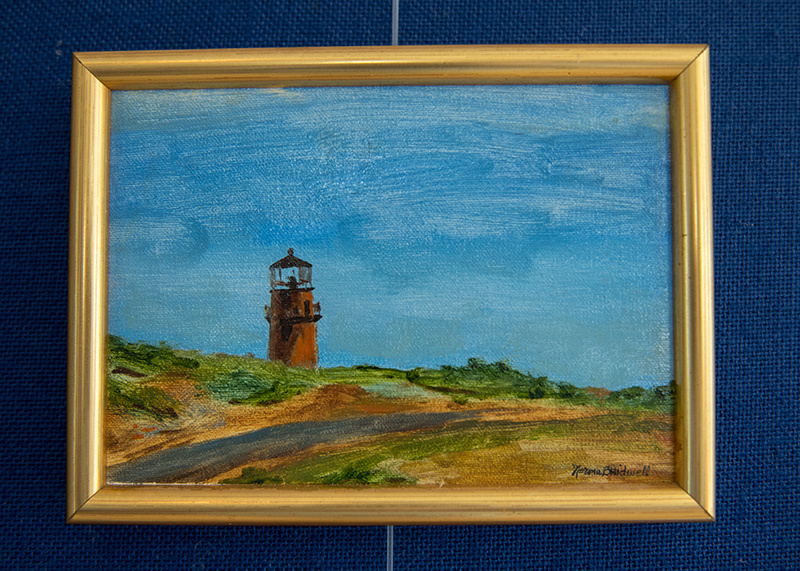 Norma Bridwell’s paintings will be hanging at the Edgartown Council on Aging Anchors building through the next few weeks. The Anchors, located at 10 Daggett St., is open from 9 am to 4 pm, Monday through Friday. All are welcome to stop in during business hours.